We’d love your help. Let us know what’s wrong with this preview of The Tiny Tale of Little Pea by Davide Cali. When he was born, Little Pea was tiny. Teeny-tiny. His clothes were hand sewn by his mother and his shoes were hand-me-down doll shoes. As he grew older, Little Pea enjoyed climbing tomato plants, driving around in his wind-up car and riding on the backs of grasshoppers. But then Little Pea started school. And he suddenly realized just how small he was. Too small for his c When he was born, Little Pea was tiny. Teeny-tiny. To ask other readers questions about The Tiny Tale of Little Pea, please sign up. The story of the Tiny Tale of The Little Pea reminds me of the stories of Thumbelina and Stuart Little. Despite the similarity, Davide Cali wrote this beautiful children's story to uplift kids — especially those who dreams of becoming an artist/illustrator someday — that indeed, one can never be too small to be a great artist. 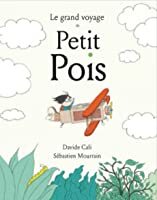 Furthermore, the cute illustrations drawn by the Sébastien Mourrain, that kids will definitely adore — contributes a lot that makes this story book very splendid. Underbara illustrationer! Och riktigt fin och hoppfull berättelse. "För man är aldrig för liten för att bli något stort"
I really liked this book. We see a really interesting life of a small person. It shows that everyone can find his place in this world and be happy. The book is very positive and has beautiful illustrations. His size is not a hindrance. It is a gift. But Little Pea does not let his size hold him back. He discovers a passion for drawing. This niche becomes the path which leads Little Pea into adulthood, where he is able to His size is not a hindrance. It is a gift. But Little Pea does not let his size hold him back. He discovers a passion for drawing. This niche becomes the path which leads Little Pea into adulthood, where he is able to use his passion for a career in designing postage stamps. The illustrations from Sebastien Mourrain are bright and colorful. My daughter loved this book. And the artwork is one of the main reasons. When Little Pea sits under the tree by himself during recess, you feel empathy for him. I'm certainly not the target audience but I found it just so adorable! There isn't much to say about the story as it's very short and simple, there's also not much text (perfect for children who are learning to read), but it's the art that makes "The Tiny Tale of Little Pea" stand out. The colour palette used for the cover caught my attention right away and the inside of the book is even prettier. Every single page is a work of art and cats "hidden" in various places are a very cute bonus. My fa I'm certainly not the target audience but I found it just so adorable! There isn't much to say about the story as it's very short and simple, there's also not much text (perfect for children who are learning to read), but it's the art that makes "The Tiny Tale of Little Pea" stand out. The colour palette used for the cover caught my attention right away and the inside of the book is even prettier. Every single page is a work of art and cats "hidden" in various places are a very cute bonus. My favourite page is probably the one with Little Peas house - so lovely! Little Pea is minuscule. He goes on grand adventures and doesn't think anything of his smallness until he starts school. He grows up (just a little bit), get a job. Drawing stamps! He loves drawing, and after all, you're never too small to draw. It doesn't matter what size you are, you can still grow up to be whatever your heart desires. Little pea proved just that by learning how to adapt regardless of his size. He found what works for him. Thank you to NetGalley for providing a digital ARC of this book. The Tiny Tale of Little Pea by Davide Cali is a beautifully illustrated children's book with a meaningful message on the power of being different and the importance of being yourself. The illustrations are understated yet detailed, and very adorable. I think children will love looking at the detail in the pictures and be warmed by such an uplifting story. A terrific little book! Little Pea was born teeny tiny. So tiny he could sleep in a match box. He had grand adventures and never even realized how small he really was until he started school. His desk was too big and he was too small to play with the other children so he spent his recess drawing. His teacher wondered what would become of him. He didn't grow much bigger as he got older, but he did build himself a cozy little home and even found the perfect job! Sweet and whimsical, with rather darling illustrations, and a thoughtful storyline. Sometimes he would float on a lily pad, where he would daydream and marvel at the size of the universe. It wasn't until Little Pea started school that he realized he was too small. As a child I was always the smallest in my class and loved the story Thumbelina. My mother often said 'The best things come in small packages' and 'Mini but mighty' when I struggled with others teasing me because of my size or to reach things on high shelves without humiliation (that is still a struggle...). Then I found gymnastics, a sport where being tiny was an advantage and have never looked back (though I do sometimes look around for tall people when I want something on the top shelf in a supermarket). Books promoting messages of diversity and equality are always valuable and I am happy to add this to my reading list for my class - even us little ones have a voice, a dream and a unique skill! Poor Little Pea. What will become of him? his teacher wondered. One can never be too small to be a GREAT artist! What I liked: The style of the illustrations and the positive message that we can all achieve something amazing, regardless of our size, shape or colour. What a delightful book and what a sweet, loveable main character. Little Pea is micro-size. His mother has to make his clothes, he sleeps in a matchbox and he drives a wind-up car. He grows older but remains mini-size. He explores his world around him and loves to wrestle, rappel off his lego tower, read books, ride horseback (mmmm... not a real horse, would you believe a grasshopper substitute?) and swim in the frog pond. He is a very good swimmer by the way. He taught himself that skill at a ve What a delightful book and what a sweet, loveable main character. Little Pea is micro-size. His mother has to make his clothes, he sleeps in a matchbox and he drives a wind-up car. He grows older but remains mini-size. He explores his world around him and loves to wrestle, rappel off his lego tower, read books, ride horseback (mmmm... not a real horse, would you believe a grasshopper substitute?) and swim in the frog pond. He is a very good swimmer by the way. He taught himself that skill at a very young age. He starts school and cannot fit in. Everything there is oversized and down-right dangerous for a little guy his size. His teacher looks at him and wonders what will happen to him in the future? How will he ever manage when his school life is over? One thing that Little Pea discovers is that he loves drawing and guess what? He's very, very skilled at it. As he journeys into adulthood he takes it upon himself to build his own home, grow tomatoes in his yard, and daily zooms to work in his wind-up car. Can you guess what his job might be? It's one that is tailor-made perfectly for Little Pea and everyone gives him their stamp of approval! The illustrations are packed full of details and emotions and look almost animated. Kids will gobble them up and learn a very valuable life lesson - that even the smallest among us can make a big mark. I highly recommend this book. I was excited to read another picture book by one of my favorite publishers: Kids Can Press. Not all picture books meet everyone's criteria, but I find most of their books click with my need for some humor. While the story of Little Pea is not necessarily a humorous one, the wonderful illustrations make you smile. As you might guess, The Tiny Tale of Little Pea is about a teeny-tiny baby. A baby who wears discarded doll shoes, learns to swim in the sink and enjoys tightrope walking over the wast I was excited to read another picture book by one of my favorite publishers: Kids Can Press. Not all picture books meet everyone's criteria, but I find most of their books click with my need for some humor. While the story of Little Pea is not necessarily a humorous one, the wonderful illustrations make you smile. As you might guess, The Tiny Tale of Little Pea is about a teeny-tiny baby. A baby who wears discarded doll shoes, learns to swim in the sink and enjoys tightrope walking over the waste basket. There are many cute illustrations showing him loving life in spite of his size. That is until he starts school. By comparison, not much works for him at school, so he sits alone drawing. We then move to Little Pea as a grown up, which mainly means age not stature. He has a house, but can he find a job? I received this book for free from the publisher in exchange for an honest review. This in no way affected my opinion of the book, or the content of my review. The Tiny Tale of Little Pea is the story about a teeny tiny boy. Because of his size everything has to be customized for him. When he goes to school he realizes that he is too small for everything there. No one knew how he would be able to survive in the world. But he makes due with what he has. He builds himself a little house and even gets a job. Drawing stamps. I really liked the illustrations in this book. The story was cute and inspiring. It teaches that no matter how small you are, you can still make a big impact. There is always something that you can be good at. If you are not able to do somethings there are always ways to do what makes you happy. This was an updated Stuart Little. The same concept of a little boy living in a big world. "Even the littlest among us can make a big mark." At first read, I didn't particularly like the way this story made me feel. It bothered me that Little Pea didn't seem to have a very supportive school environment. It bothered me that no friends were ever mentioned. But then, I re-read the story. I focused on Little Pea's expressions. I looked at how the story ended. I realized that Little Pea wasn't sad, nor did he feel sorry for himself or seem to feel that he'd been short-changed (and no, I really didn't intend that to be a pun, but, well, th At first read, I didn't particularly like the way this story made me feel. It bothered me that Little Pea didn't seem to have a very supportive school environment. It bothered me that no friends were ever mentioned. But then, I re-read the story. I focused on Little Pea's expressions. I looked at how the story ended. I realized that Little Pea wasn't sad, nor did he feel sorry for himself or seem to feel that he'd been short-changed (and no, I really didn't intend that to be a pun, but, well, there it is). Ultimately, Little Pea may be small in stature, but there is nothing small about his ability to be true to himself, to find his own way, and ultimately make his own place in the world. I am very curious to see how my students will react to this story. It seems tailor-made for discussion of main idea and theme. The illustrations drawn by the Sébastien Mourrain, contributes a lot that makes this storybook as amazing as it is. The illustrations are packed full of details and the hidden 'cats' made them all the more interesting. There is an obvious color palette to the story, which only enhances the tale, making each page its own individual work of art. Once again we are given a story based on the power of being different. 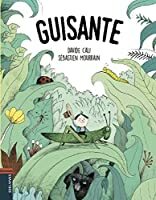 For the age group, this is an important lesson and a concept that can be grasped by The illustrations drawn by the Sébastien Mourrain, contributes a lot that makes this storybook as amazing as it is. The illustrations are packed full of details and the hidden 'cats' made them all the more interesting. There is an obvious color palette to the story, which only enhances the tale, making each page its own individual work of art. Once again we are given a story based on the power of being different. For the age group, this is an important lesson and a concept that can be grasped by children as young as 4 years old. this is a beautiful read-aloud story, that is engaging and will keep your children entertained. I could see this quickly becoming a staple in my household or anyone looking to collect emerging new 'classic' children's books. I enjoyed reading The Tiny Tale of Little Pea as it's a fun story about Little Pea who finds he's too small to do many things. He finds a job that suits him perfectly and seems to live happily ever after. However, as a teacher who is constantly trying to encourage children to do whatever it is they enjoy regardless of size etc I feel this book doesn't support that. It left me with a feeling of if you're small there are lots of things you can't do so you shouldn't keep trying/settle for something I enjoyed reading The Tiny Tale of Little Pea as it's a fun story about Little Pea who finds he's too small to do many things. He finds a job that suits him perfectly and seems to live happily ever after. However, as a teacher who is constantly trying to encourage children to do whatever it is they enjoy regardless of size etc I feel this book doesn't support that. It left me with a feeling of if you're small there are lots of things you can't do so you shouldn't keep trying/settle for something easy. I'm sure this isn't the message that the author wanted and I'm possibly reading too deeply but if I was to share this with my class I'd remind them about resilience and determination. Originally issued in French, this story of what it is like to be a very small person (think Thumbelina or Tom Thumb). All of the adaptations you have to improvise, the creative solutions to problems you must solve. But, what of your future? Little Pea ends on a high note, overcoming all obstacles placed in his way. All told in this charming tale. Davide Cali is rapidly becoming one of my favorite authors for a different way to look at problems. Illustrations were rendered in pencil crayon then co Originally issued in French, this story of what it is like to be a very small person (think Thumbelina or Tom Thumb). All of the adaptations you have to improvise, the creative solutions to problems you must solve. But, what of your future? Little Pea ends on a high note, overcoming all obstacles placed in his way. All told in this charming tale. Davide Cali is rapidly becoming one of my favorite authors for a different way to look at problems. Illustrations were rendered in pencil crayon then colored digitally by Sebastien Mourrain. He has done a marvelous job of offering life from the perspective of a small person, showing Little Pea in the vastness of space. Colorful and comical, they add much to the story. Little Pea is teeny-tiny. He’s so small that he can sleep in a match-box and climb on Lego structures. His life is wonderful, and his size doesn’t bother him—until he starts school. All of a sudden, he’s too small for everything. He’s too small for his chair, for his flute, for gym class, and for lunch. Despite his experience at school, Little Pea learns how to live with his size in a world that is so much larger than he is. Kids will love seeing him drive around in wind-up cars! The illustrations Little Pea is teeny-tiny. He’s so small that he can sleep in a match-box and climb on Lego structures. His life is wonderful, and his size doesn’t bother him—until he starts school. All of a sudden, he’s too small for everything. He’s too small for his chair, for his flute, for gym class, and for lunch. The illustrations in this book are fabulous. The pictures of Little Pea riding a grasshopper or climbing the tomato plants are adorable, and convey perfectly just how small Little Pea really is. Little Pea fin dalla nascita è veramente minuscolo, ma non per questo non ha passato un'infanzia divertente: ha imparato a nuotare, ad arrampicarsi e ha esplorato il giardino dal suo minuto punto di vista. Da grande però che lavoro potrà mai fare un omino così piccolo? Per fortuna Little Pea è molto creativo e non si scoraggia davanti alle difficoltà! Il libretto è grazioso, pochissime le frasi, utili più come comento alle illustrazioni già esplicative. Plot: The Tiny Tale of Little Pea is about a boy who was born very small. He loved to do everything that other kids did. Then when he went to school he found himself to be to small to do anything with the other kids. One thing that Little Pea did love was to draw. He than grew up and found a job where he could draw stamps. I received this ARC from Netgalley for an honest review. Little Pea is very small. He sleeps in a matchbox and his shoes are let over doll shoes. Little Pea doesn't realize that his height or lack of makes him different until he gets to school. He is too small for his desk, for his lunch and especially for gym class. He spends recess by himself drawing. His teacher worries about what he will do with his life. It turns out that his job is perfect for him and his size. A beautifully written book wi I received this ARC from Netgalley for an honest review. I received an electronic copy of The Tiny Tale of Little Pea from Netgalley in return for an honest review. This is a cute story about a very tiny person who finds out, when he goes to school, that the world is not very inclusive of very small people. He does in the end find a satisfying role in the world. The illustrations are great and I really liked the ending. In some ways Little Pea reminded my of Stuart Little. I received a copy of this book through the Goodreads Giveaway program in exchange for an honest review. 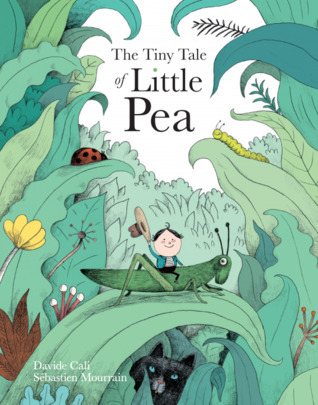 This is a fun, short, inspiring story of Little Pea, a boy who doesn't let his size get in the way of doing the things he wants. With beautiful illustrations and simple sentences, this is a perfect book for beginner readers but also a great motivational tale for little ones in general! Will definitely be sharing with the "Little Peas" in my life. Little Pea is teeny tiny but he makes it work. Everything small becomes an adventure, but when he goes to school he realizes everyone and everything else is big. Being a positive guy he presses on and soon finds a special career just suited for him. A wonderful story about persistence, optimism, and perseverance and how there is a place for everyone. Little Pea is a tiny little boy in a big world, but he never lets that get him down. Little Pea makes the best of his world in this beautiful whimsical tale of perseverance. The illustrations are delightful and create a world that any child would enjoy. I received this book as an ARC in return for an honest review. 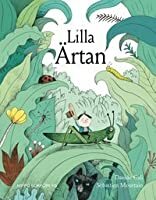 I am a sucker for stories with little characters (Thumbelina, Inchkin, the Littles) and this one is adorable. Whimsical illustrations and a focus on all that Little Pea can do, rather than can't. Sweet! 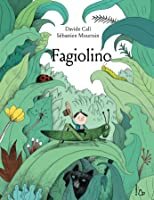 Davide Cali (born 1972) is a Swiss-born Italian writer of picture books and graphic novels, primarily for children and young adults. He lives in Italy. His work has been published in twenty-five countries and translated into many languages.